Replenishing the planet, one seed at a time. WithOneSeed takes a simple approach to building the social and economic participation of communities with an objective of reducing dependency on charity and aid. The WithOneSeed method operates through the creation of social enterprise initiatives. Putting an earned dollar in someone’s pocket gives them the power to make decisions about their future. WithOneSeed is a social enterprise that works with communities across the Asia-Pacific region to make environments sustainable, to end poverty and hunger, to increase access to open education and to build regional relationships and understandings. WithOneSeed is taking particular action on climate change through community forestry projects to improve the resilience of subsistence communities and increase their sustainability. WithOneSeed is ‘planting’ seeds to enable Australian students to better understand carbon and their environment, their culture and their rights and responsibilities as regional citizens. WithOneSeed is working with subsistence farming communities to generate an income from community forestry and, as an extension, to build local economies, boost education and training, and deliver social and economic participation. We’re working for environmental sustainability, one seed at a time. 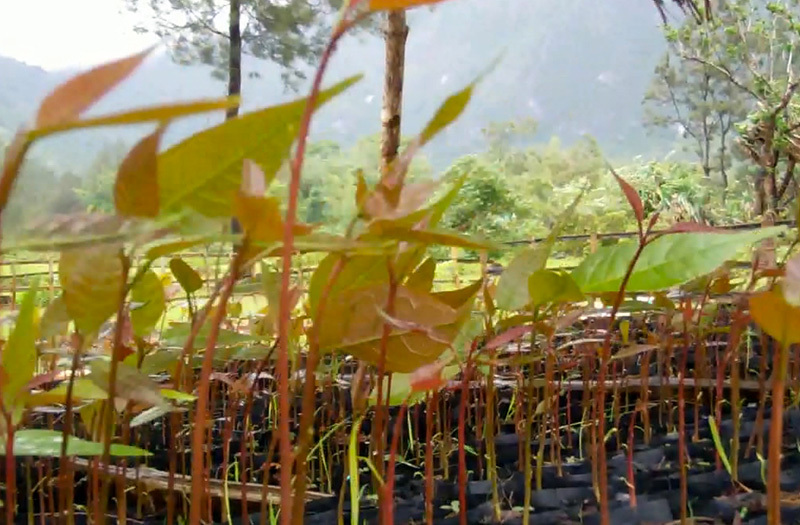 Reforestation is a key response to global climate change. It provides a highly effective form of carbon capture and storage while reducing soil erosion and degradation and improving the habitat and water table. 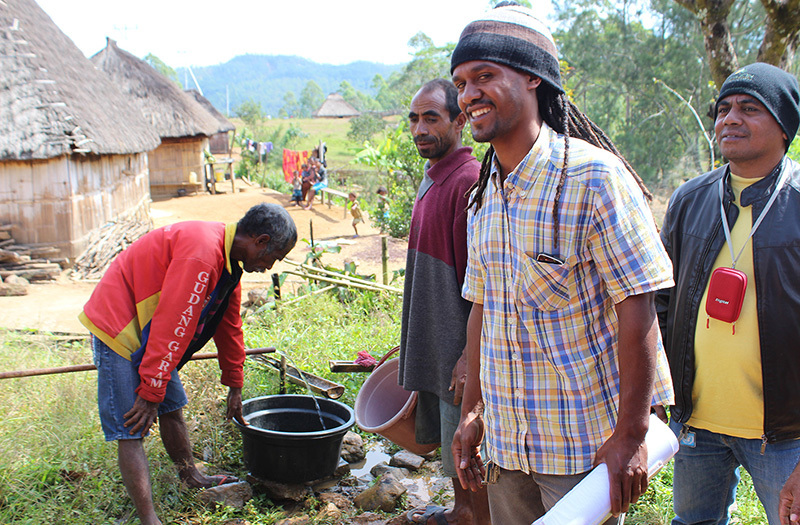 WithOneSeed works with subsistence farming communities in Timor Leste to establish village-based community forestry projects managed by local Community Tree Cooperatives. We’re working to end poverty and hunger, one dollar at a time. Increasing social and economic participation in subsistence communities helps end poverty and hunger, creates employment opportunities, raises living standards and improves infrastructure. WithOneSeed makes annual payments to members of the Community Tree Cooperatives for managing and maintaining trees. This significantly increases annual income of subsistence farmers who earn less than a dollar a day in rural communities. We’re working to build knowledge, one learning at a time. Education is a key to building the capacity of the next generation. Citizenship (how we live – our rights and responsibilities). We’re working to build relationships, one partner at a time. Establishing relationships across cultures and building partnerships between communities will ensure the next generation understands their role and responsibilities as global citizens. WithOneSeed is auspiced by the xpand Foundation, a social enterprise committed to an inclusive society that values a sustainable livelihood, happiness and economic participation in a society devoted to a green future in the? digital age. The xpand Foundation’s co-founder, Andrew Mahar AM, has been developing social enterprise models for over 25 years. 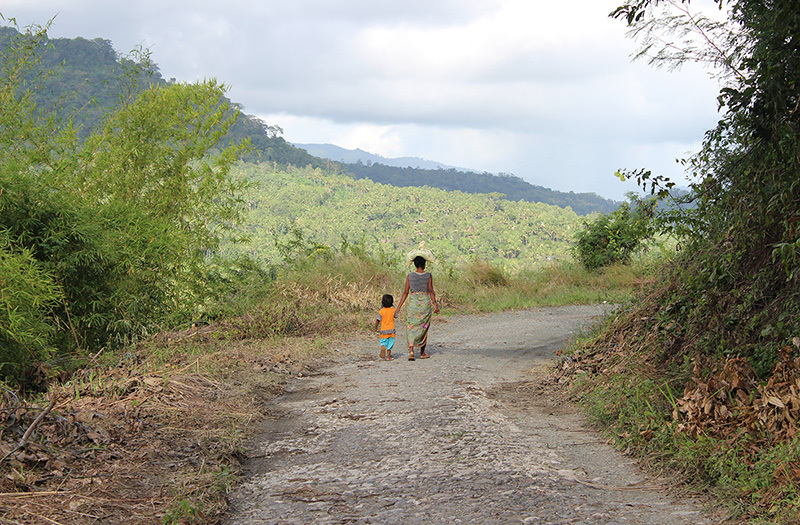 The road to Baguia, Timor Leste. Baguia is a sub-district of Baucau. A rural, mountainous region, it covers approx. 22,000 hectres and has a population of approx. 14,000 people; many are living below the international poverty line of $1.25 per day. 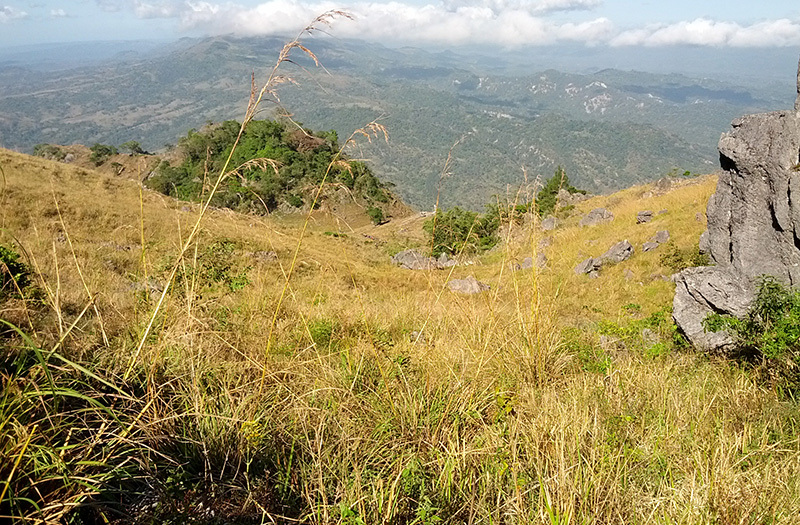 At its heart is Mount Matebian, the second highest peak in Timor Leste at 2315m. 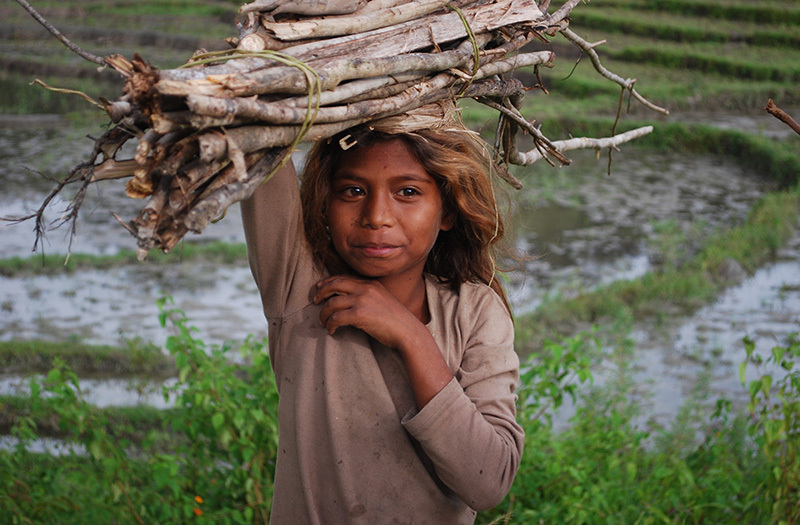 The forests of Timor Leste experienced mass deforestation during the Indonesian occupation. It is estimated that over 80% of primary and secondary forests were destroyed between 1975 to 1999. The ripple effect of deforestation, includes soil erosion and reduced water and soil quality, which leads to a reduction of crop yeilds, animal fodder, housing materials and nutritional foods. This significantly impacts on the health and welbeing, education and employment opportunities and on local economies of subsistence communities. WithOneSeed had designed and constructed 3 village-based nurseries each with capability to propagate 20,000 seedlings annually. This photo is of the nursery in a village called Afolicia. 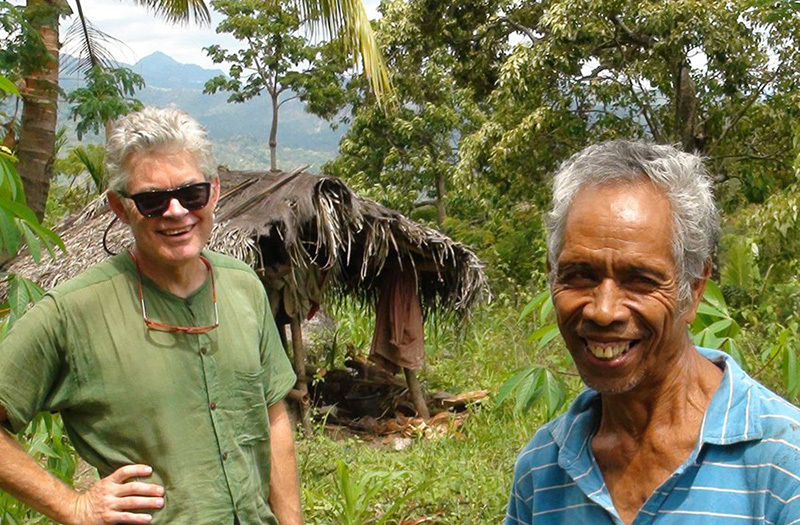 Project Director Andrew Mahar AM with Bellmero, one of 251 Community Tree Cooperative members in Baguia, Timor Leste. 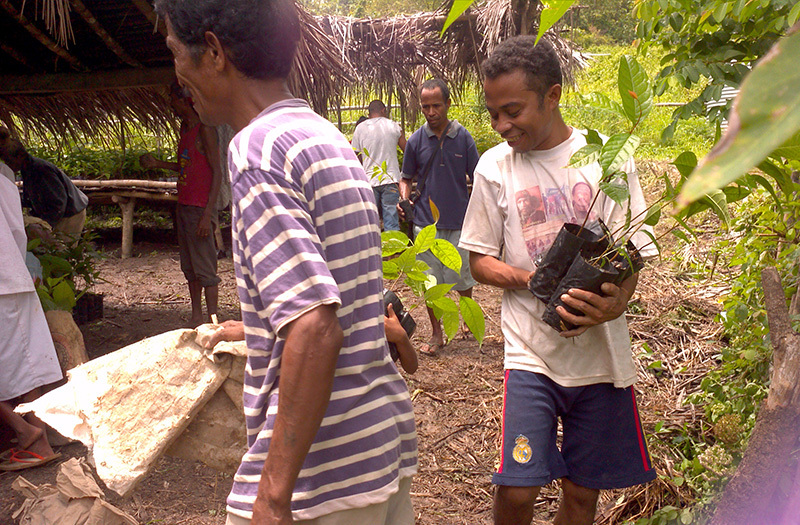 To date 40,093 trees have been planted and are under the management of the Community Tree Cooperatives. The mahogany trees reduce soil erosion, improve water and soil quality and reduce the noxious weeds that dominate the landscape as a result of many years of deforestation. Replenishing the planet, one seed at a time. Collecting, sorting and storing seeds for germination, increases knowledge, skills and employment opportunites in the comunity. 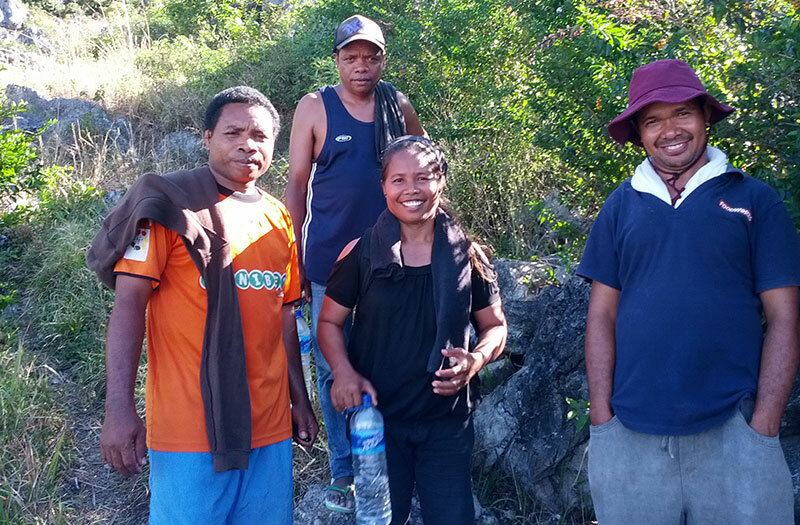 Under the management of Leopoldina Guterres and Andrew Mahar, Ho Musan Ida staff meet regularly to discuss the work and future planning of the initiative in Baguia Timor Leste. The sub-district of Baguia covers an area of approx. 22,000 hectres with little transport. 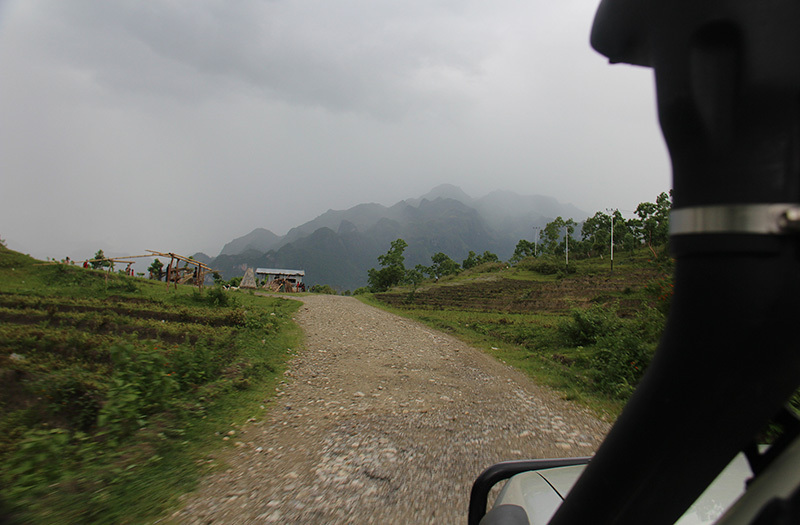 The basic gravel roads, are susceptable to floods and landslips. 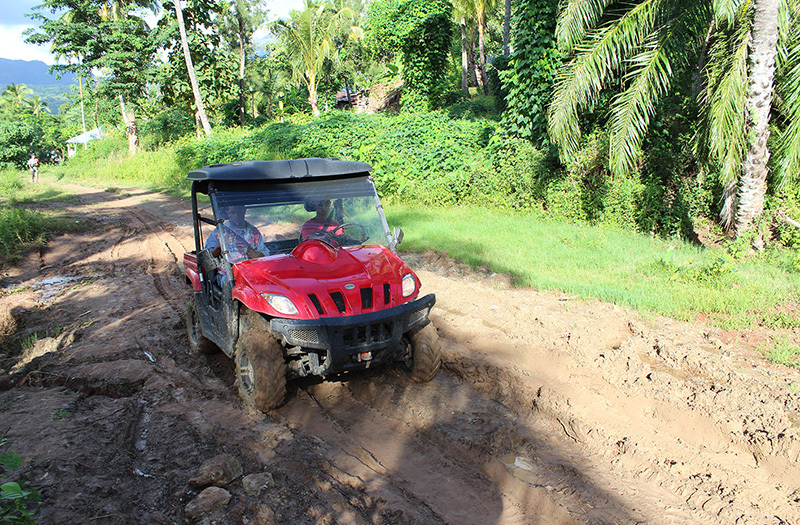 The little red Drover is an all-terrain vehicle that helps staff to transport equipment and materials between the nurseries which are spread across the sub-district, saving them an otherwise 3+ hour walk (one way!). The seeds are germinated and propagated at the village-based nurseries over a 12 week period, under the management of Ho Musan Ida staff. 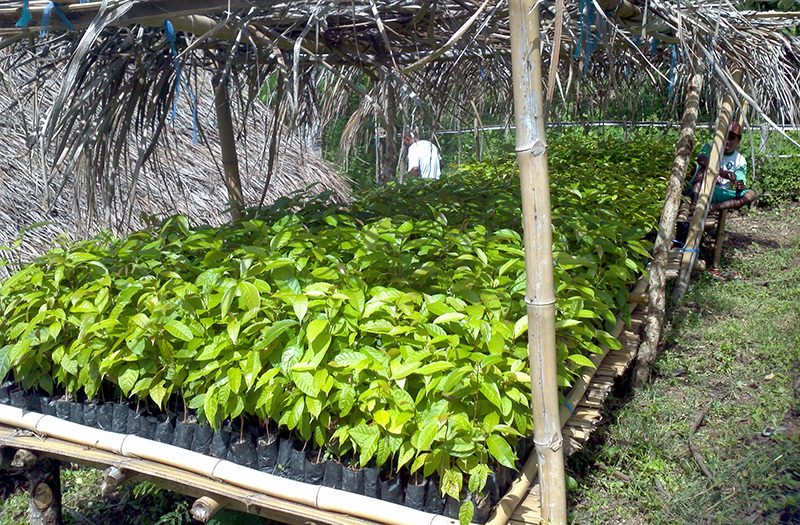 The saplings are then distributed to Community Tree Cooperative members to plant on their land. Every year the trees are audited and their GPS waypoint locations are recorded. 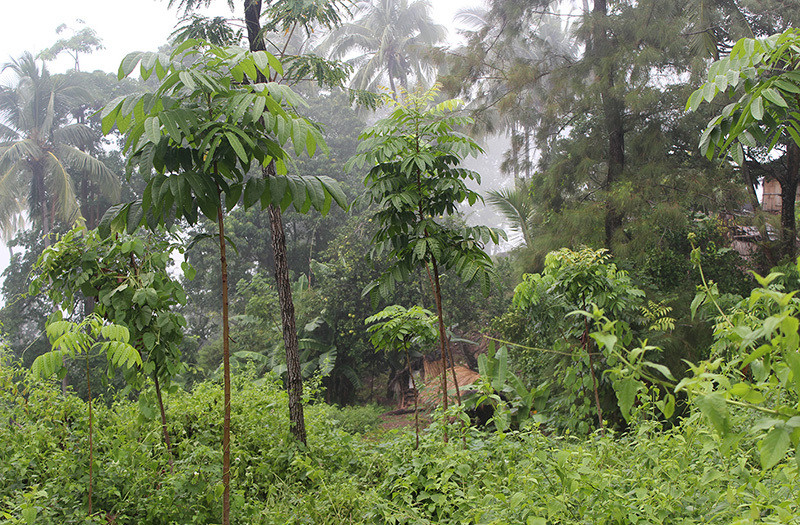 Annual payments are then made to farmers for planting and maintaining the trees. For many subsistence farmers, this can more than double their annual income, which is as low as 80c a day. Building the local economy through social enterprise supports the wider community. Using technology, WithOneSeed connects St Joseph’s Secondary School in Baguia with St Michael’s Grammar School in St Kilda, Melbourne. This was the first time the students in Baguia had experienced the internet. Connecting schools in the region will establish collaborative learning and support through educational and awareness-raising programs. Teachers participate in a plant identification workshop as part of WithOneSeed’s – Baguia Education Week. Education Week was attended by over 600 students, teachers and members of the community in 2013 and over 1100 in 2014. The program was developed by WithOneSeed in association with the Royal Botanic Gardens, Melbourne. 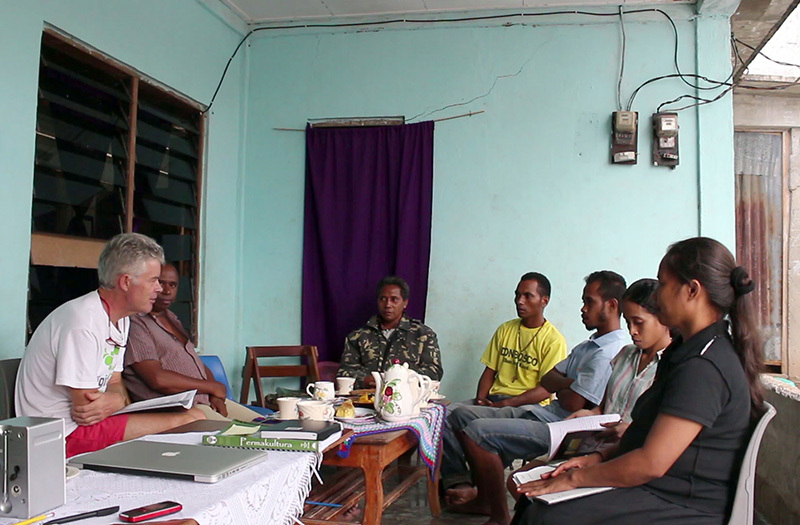 Students in Baguia participate in video interviews being produced by WithOneSeed – Open education series called In my back yard. 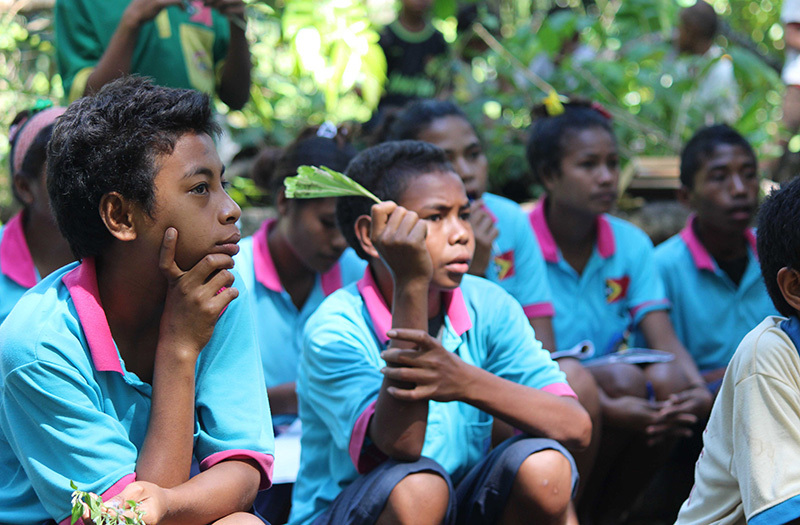 The series seeks to find out what young people in both Australia and Timor Leste think about their environment, climate change and the actions needed to replenish the planet. WithOneSeed hosted a plant identification workshop in a remnant forest, as part of the Baguia Education Week 2014. Many students walked long distances to reach the destination, which was an extraordinary day for all involved. Village Learning Centres provide access to 21st-century communications technology. This provides people living in village communities with access to education, training and e-learning opportunities that are universally accessible in Australia. A school at the top of the mountain. WithOneSeed works to connect the 35 schools in the sub-district of Baguia with schools in Australia to support each other through educational and awareness-raising programs. Out of the classroom and into the bush! 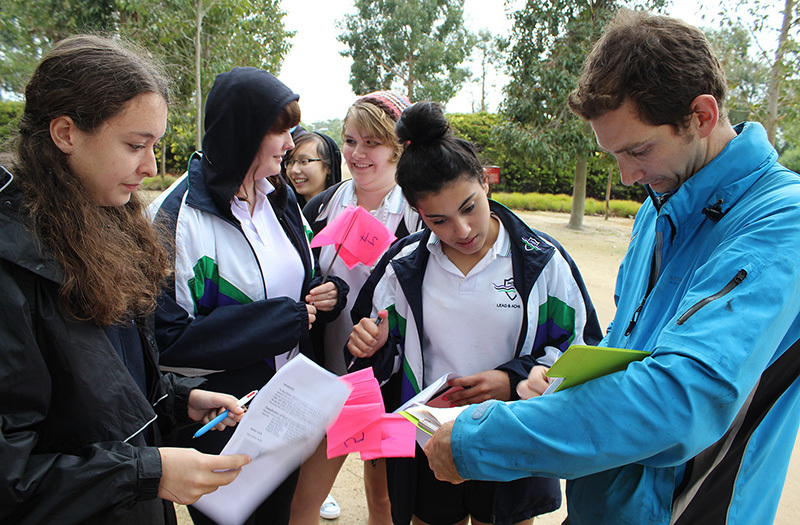 Year 10 students from Melbourne Girls' College participate in the Carbon futures program at the Royal Botanic Gardens, Cranbourne. The program was developed by WithOneSeed in association with the Royal Botanic Gardens, Melbourne. Year 6 students from St Agatha’s Primary School participate in the Carbon futures program at the Royal Botanic Gardens, Cranbourne. 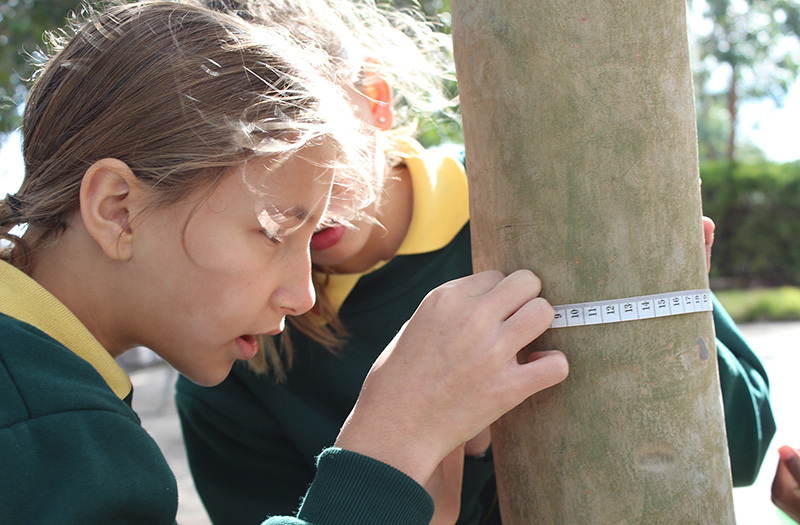 Students learn about how carbon works in different natural systems through ocean acidification experiments and measuring carbon in trees. Students also discover the many other services a forest has to offer people anywhere on the planet. 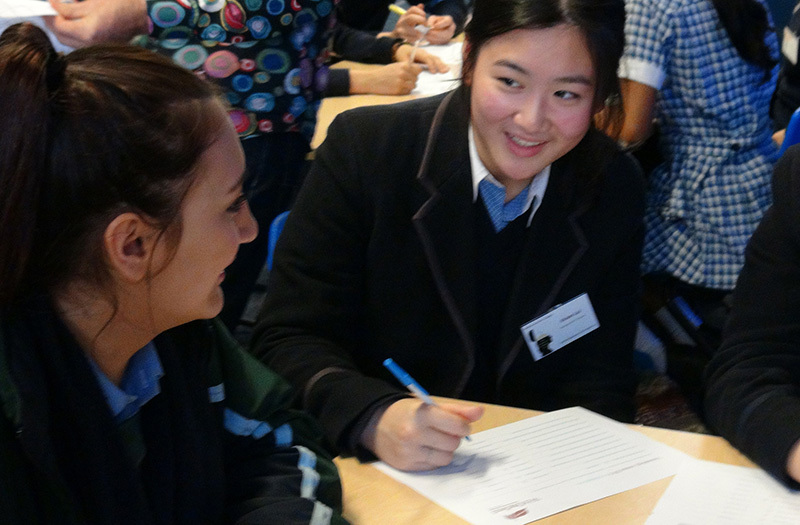 Students from around Victoria participated in WithOneSeed’s Technology consumption census workshops in 2013 and 2014 at the annual Environment Conference, hosted by Melbourne Girls' College, Richmond. 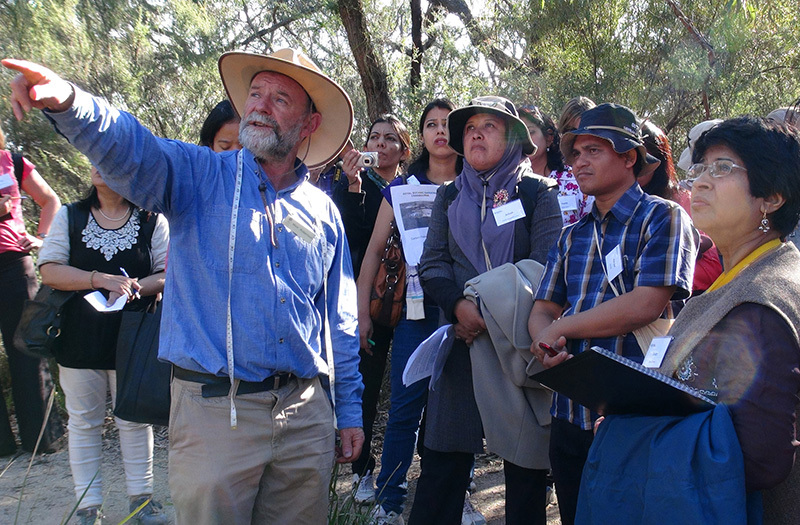 As part of a week-long visit to Australia, teachers from Indonesia and India (sponsored by the Australian Conservation Foundation) participate in the Carbon futures program at the Royal Botanic Gardens, Cranbourne. 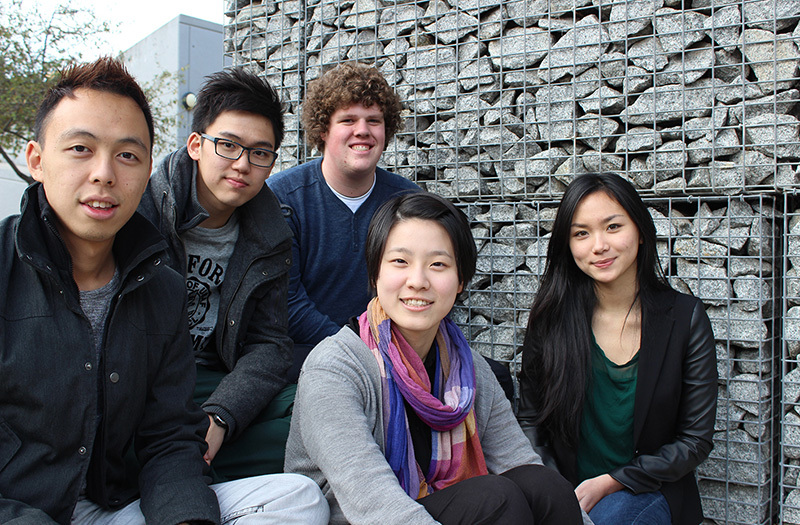 WithOneSeed has supervised seven semester-long Capstone projects with the University of Melbourne over the past four years. Capstone provides third and fourth year commerce students with opportunities to work with a social enterprise. Topics for research have included certification, sequestration, business and economic models, and evaluation and e-learning strategies. 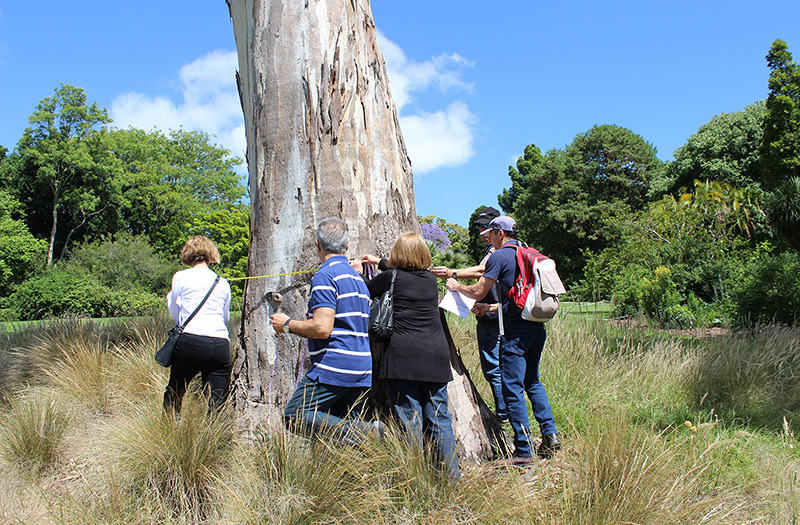 Teachers participate in the Carbon futures program at the Royal Botanic Gardens, Melbourne. WithOneSeed’s – Open education resources called WithOnePlanet, support teachers to take the program back to the classroom. The education resources focus on Carbon, Culture and Citizenship. The resources are aligned with the Australian curriculum for Years Foundation to 10. 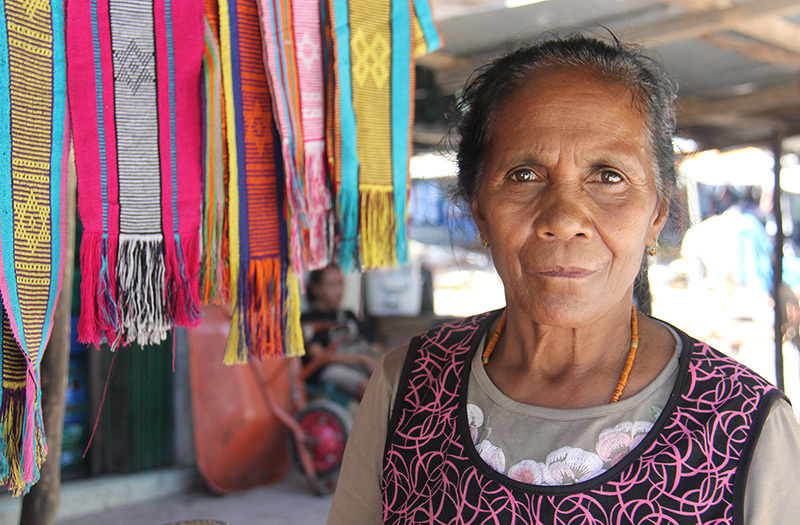 Shop keeper in Baucau, Timor Leste. Children have a significant role in supporting their family and community. 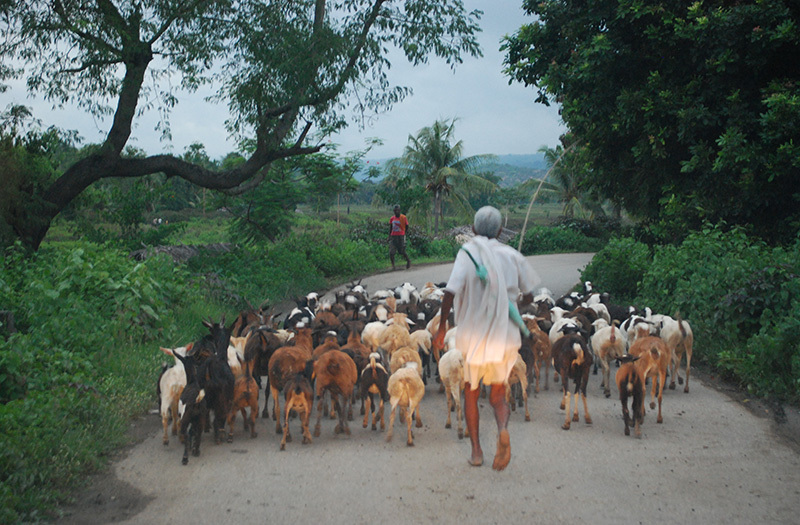 Farmer in Laga, Timor Leste. 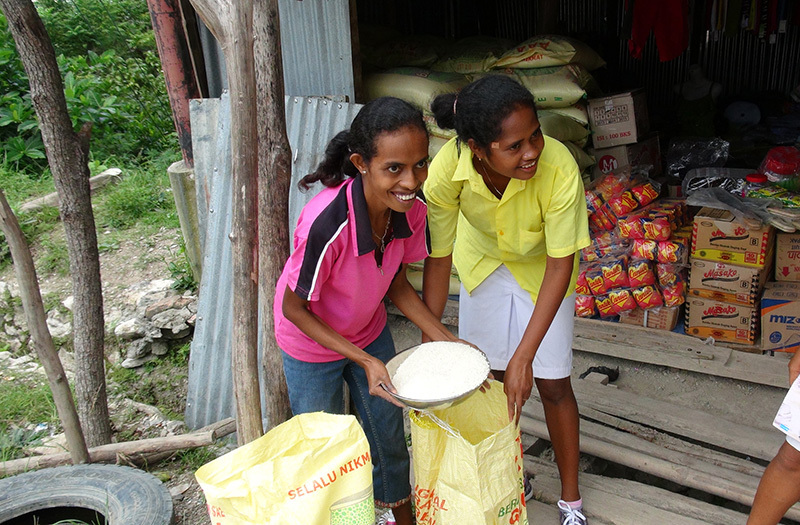 Timor Leste is a low-income subsistence based economy. 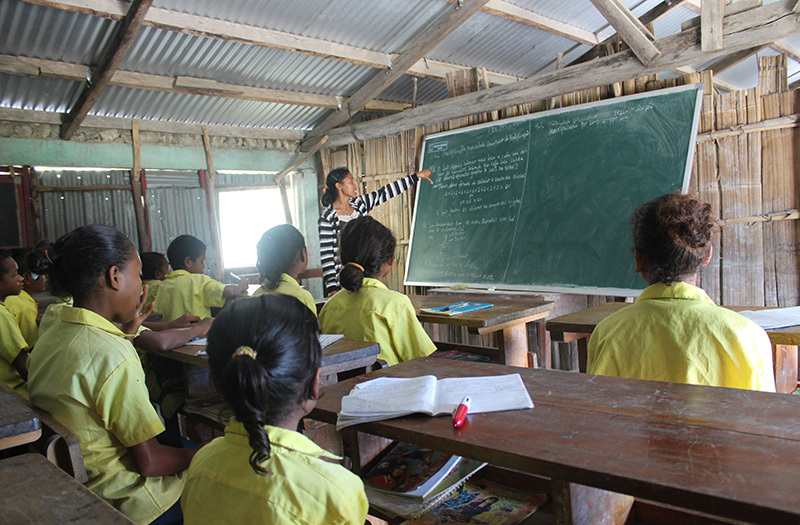 37% of the Timor Leste population live below the international poverty line of $1.25 per day; 40% of the population is malnourished; and life expectancy at birth is 62.5 years. The local store in Baguia, Timor Leste. 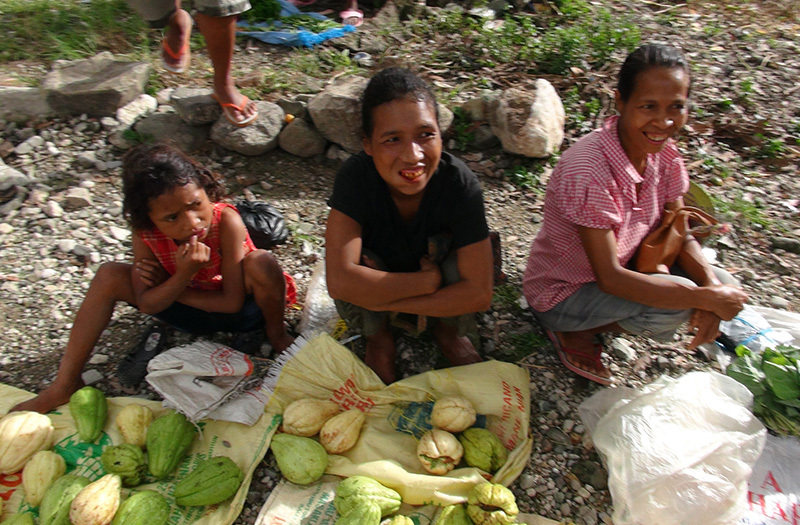 Subsistence farmers sell their crop yeilds on the side of the road of Baguia, Timor Leste. 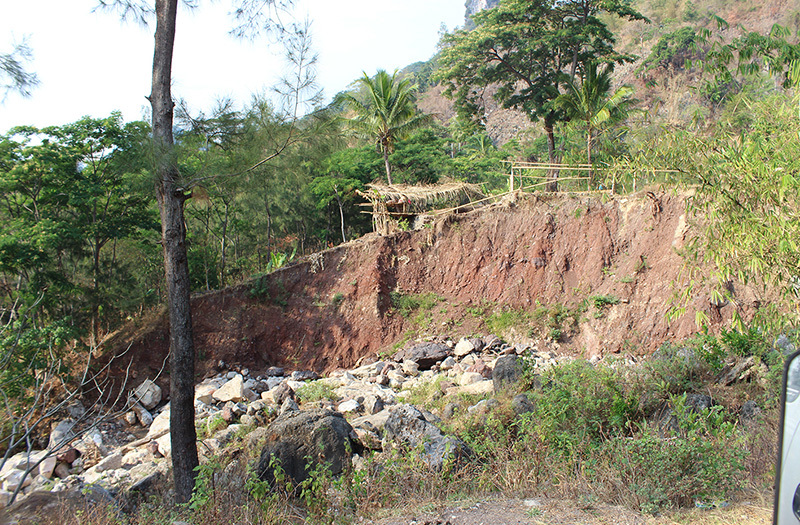 Coffee producers in the district of Ermera, Timor Leste are supported by Alter Trade Timor, a local cooperative helping farmers to produce quality coffee and improve their livelihoods, many of whom live on less than 80c a day. 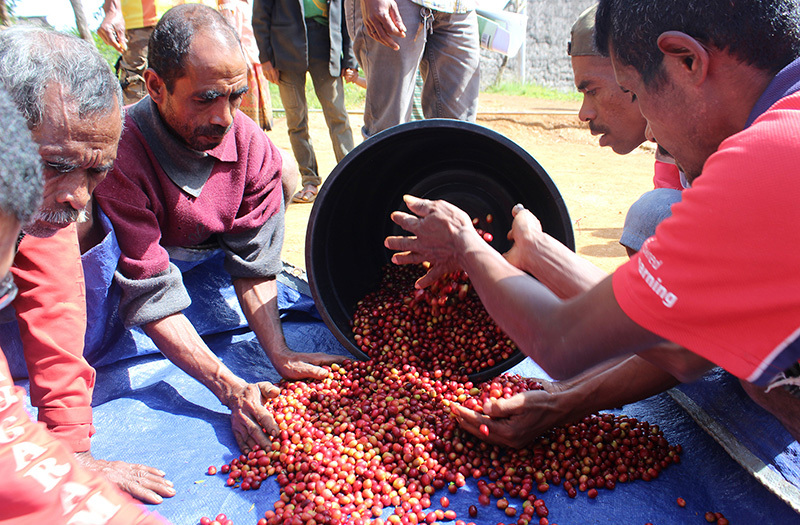 Coffee cooperative members sort the coffee cherries. 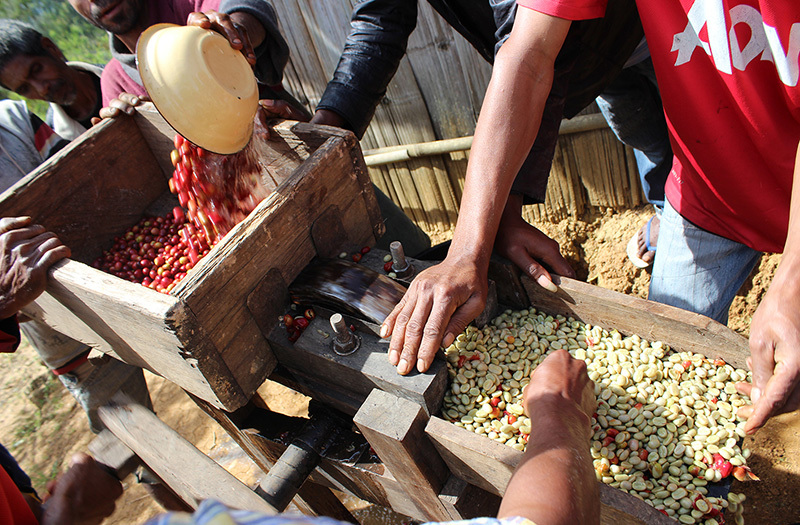 Coffee cooperative members remove the outer cherry from the coffee beans. 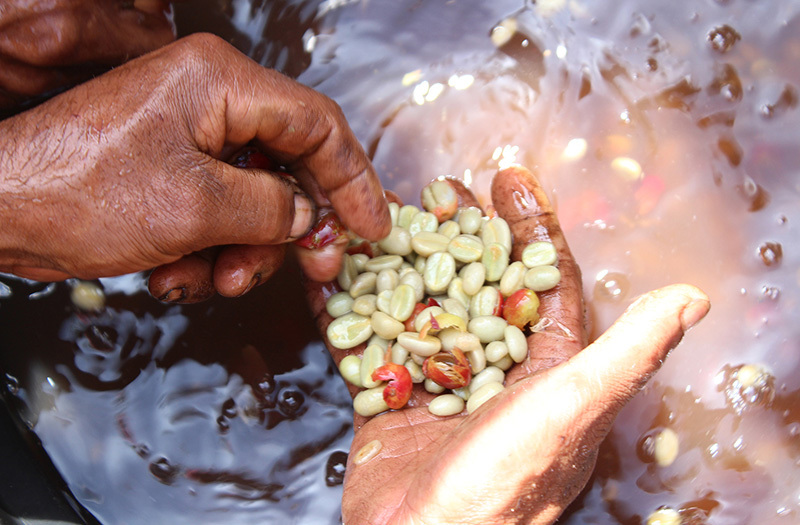 Coffee cooperative members wash the green coffee beans before drying. The green beans are then imported by Tradewinds Tea & Coffee. 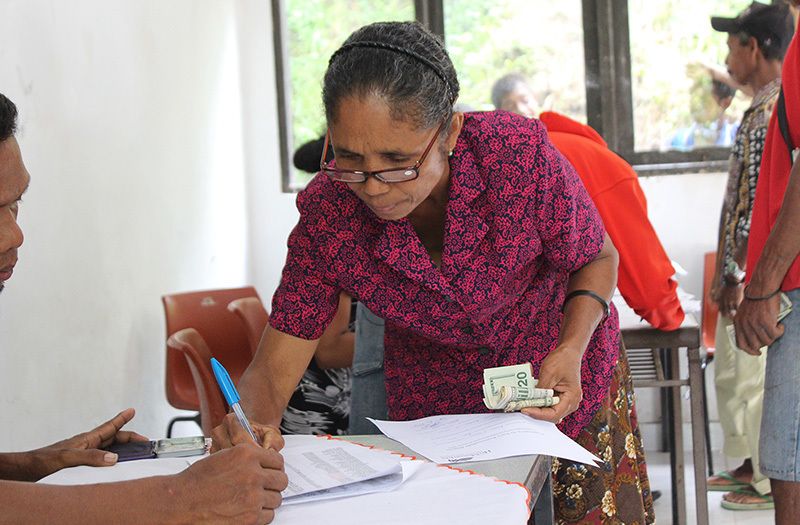 Tradewinds is a not-for-profit organisation working to build relationships to ensure a fair price for subsistence producers. 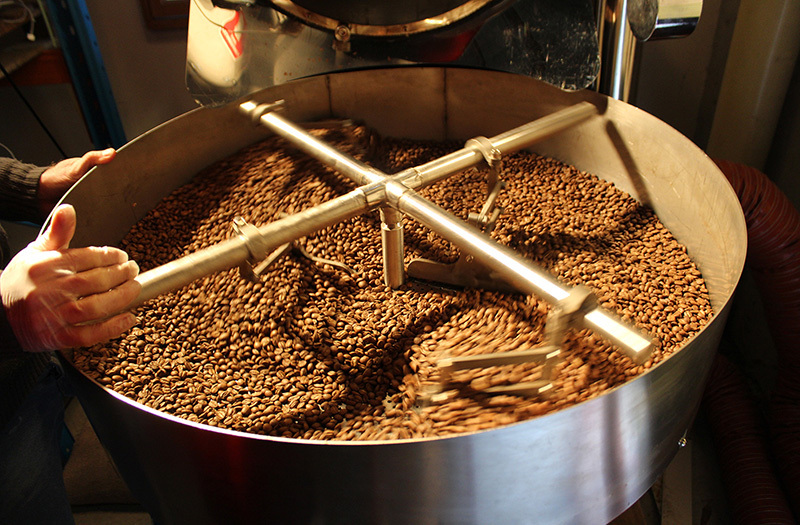 WithOneBean is a premium Arabica coffee. The green beans are grown and harvested by subsistence farming communities in Timor Leste and roasted, packed and sold in Australia. 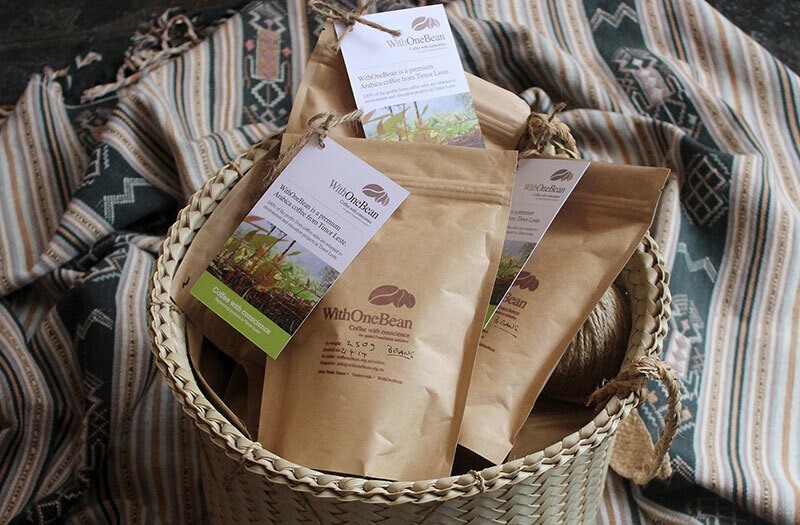 WithOneBean returns 100% of the profits from coffee sales to environmental and educational projects in Timor Leste. WithOneSeed in association with InfoTimor, connect the first Village Learning Centre to a satellite internet service. 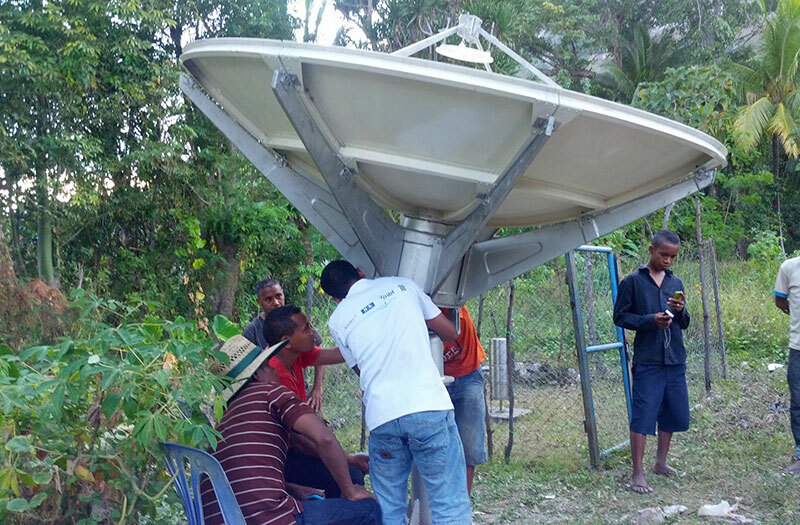 The satellite dish will provide access to 21st-century communications technology the the community of Baguia, Timor Leste. Ho Musan Ida country manager, Leopoldina Guterres, with Community Tree Cooperative farmers. 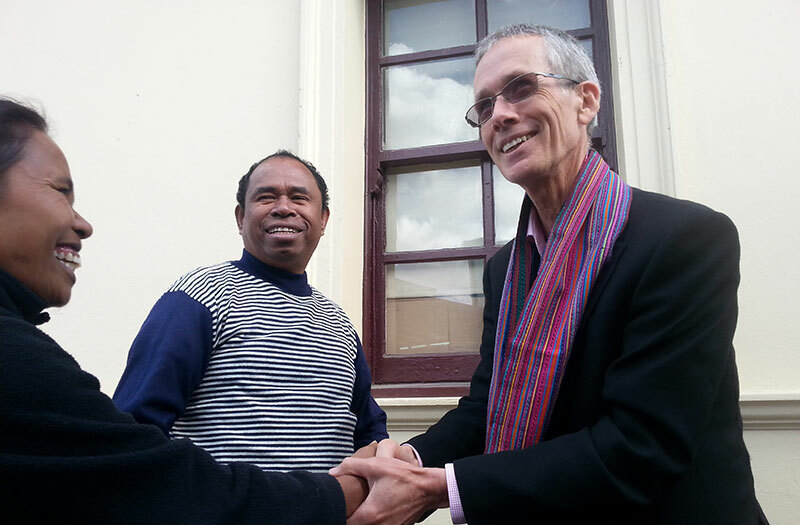 L to R: Ho Musan Ida Country Manager – Leopoldina Guterres, Sub District Administrator of Baguia, Timor Leste – Sn Antioio Dos Ramos, with Royal Botanic Gardens, Melbourne CEO – Tim Entwistle in Melbourne recently. 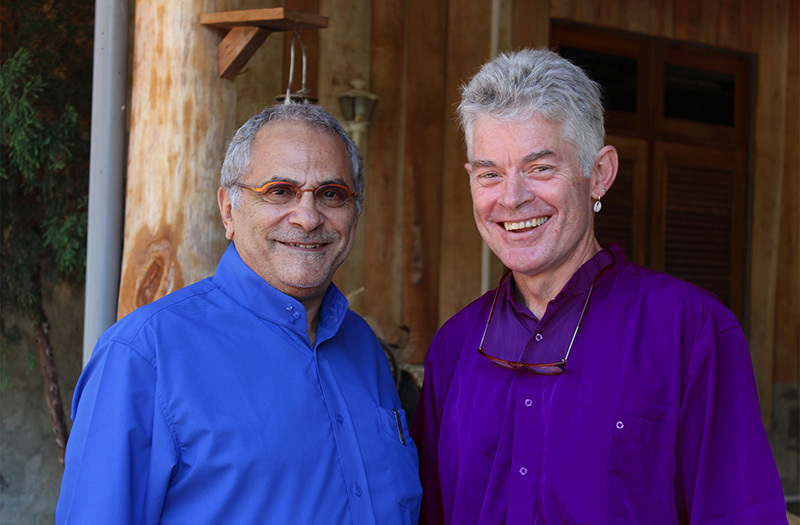 WithOneSeed Director Andrew Mahar AM with WithOneSeed Patron, His Excellency Dr Jose Ramos Horta. 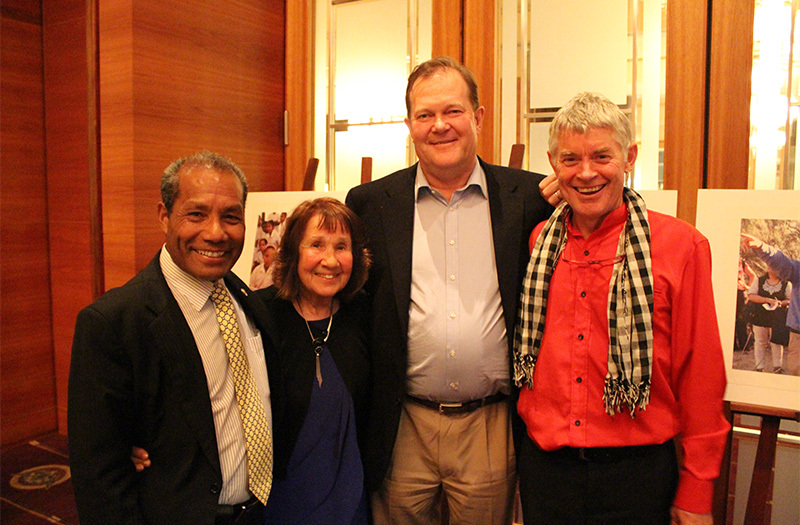 L to R: His Excellency Sr Abel Guterres, Ambassador Extraordinary and Plenipotentiary of Timor-Leste to Australia, New Zealand and Republic of Fiji; Barbara Dune, Computershare Change a Life; Stuart Crosby, former CEO Computershare; and Andrew Mahar AM, CEO xpand Foundation. 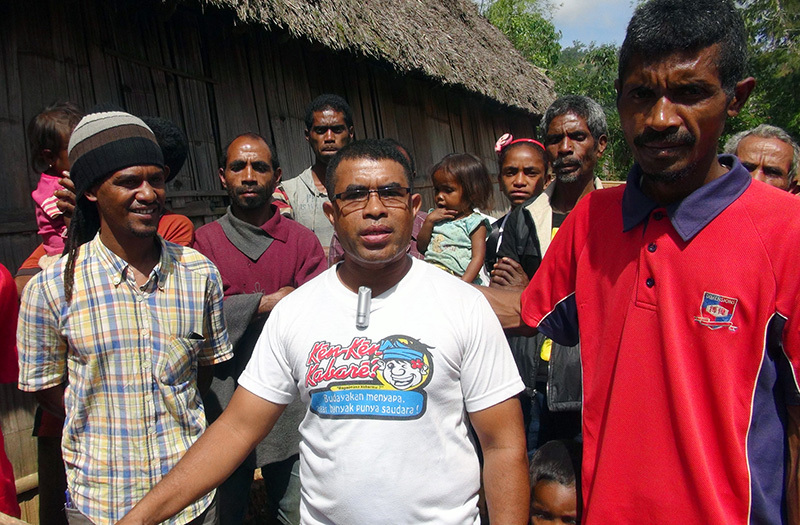 Evangelino Soares from Alter Trade Timor meets with members of the coffee cooperatives in Ermera, Timor Leste. 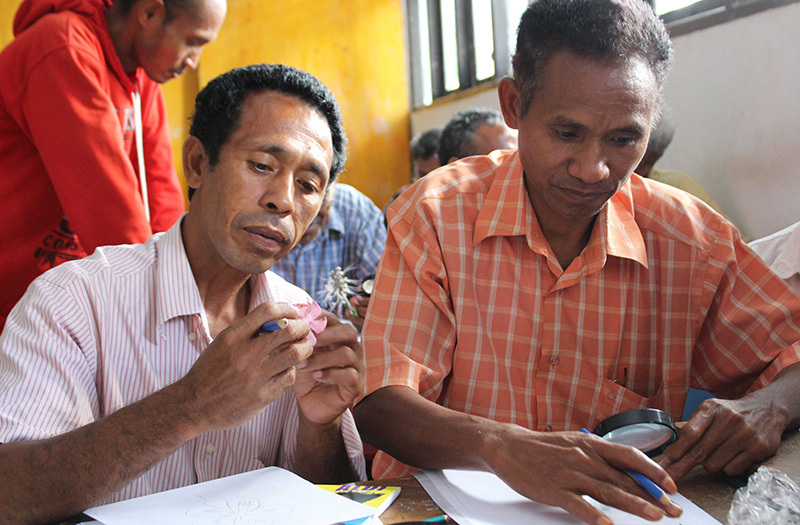 Alter Trade Timor, is a local cooperative that supports farmers to produce quality coffee and improve their livelihoods.